Hilltop House: If you seek clean, comfortable and air-conditioned accommodation in Somerset East for your visit or overnight stay, Hilltop House provides exactly what you are looking for. Situated on the hill in the modern part of the town, Hilltop House is within walking distance of the main street, Gill College and Victoria Park with all its sports facilities. If you are in Somerset East for business or to visit someone in hospital, then Hilltop House is also very conveniently located. In a private wing of the main house are three bedrooms. One has its own direct access from the pool area with a double bed and an en-suite shower bathroom. The other two rooms both have twin beds and en-suite bathrooms, one being a full bathroom and one a shower bathroom. These two rooms share an entrance and are ideal for families. In an outside cottage there are two double en-suite bedrooms, each with its own entrance. All rooms are air-conditioned and equipped with DStv and Internet access, and ample secure off-street parking is also provided. Rooms are on a bed and breakfast basis, with dinner available by prior request at an additional charge. 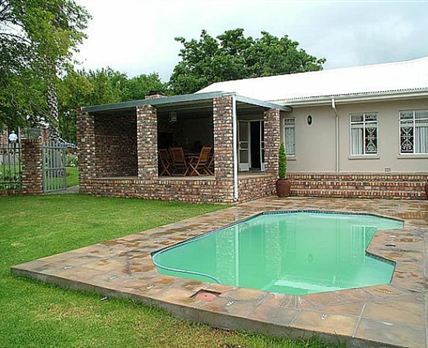 Features include a pool for guests’ enjoyment and a large covered lapa with a built-in braai, dining table and seating. Opening off the lapa is a spacious guest lounge with a welcoming fireplace for winter nights. Click here to enquire at Hilltop House.